The Philippines hosted the International Seaweed Congress this year last November 19-21. The event gathered seaweed farmers, experts, and entrepreneurs not just from the country but also from different parts of the world. The recently concluded International Seaweed Congress (ISC) held at the Waterfront Hotel Cebu and spearheaded by the Seaweed Industry Association of the Philippines (SIAP), attracted over 700 participants from Asian countries such as Indonesia, Thailand, Sri Lanka, Japan, Korea, China and the Philippines, as well as from the US and European nations. The big event marked the first time that the ISC was held in the Philippines. The SIAP-organized 2014 International Seaweed Congress gathered a roster of international experts who presented papers on various relevant topics such as, among others, seaweed farming techniques in the ASEAN region (given by the Philippines’ Dr. Gavino C. Trono, Jr.), application and demand of different seaweed species (given by Ireland’s Dr. Stefan Kraan), and protecting the carrageenan markets (given by the United States’ Dr. Harris 'Pete' Brixler). The global seaweed industry is growing with latest studies from the Food and Agriculture Organization (FAO) estimating that macroalgae (brown, red and green seaweed) production increasing from 5.7 % every year; in 2009 over 15 million tons of macroalgae were harvested from global capture and aquaculture. The Philippines is one of the world’s leading seaweed producers as it currently ranks second in Asia. According to SIAP, the Philippine seaweed industry recorded export sales of $ 217 million in 2013, with domestic sales to reach $ 14 million and export sales to reach $ 394 million by 2016. In the midst of the brighter prospects, Ricohermoso reiterates SIAP’s commitment to steer the Philippines to be a global leader in the seaweed industry while being conscientious to environmental concerns. “SIAP will surely continue to provide leadership and economic guidance to optimize the benefits for the seaweed farmers, traders, processors and exporters and other stakeholders while enhancing the ecological aspects of our oceans for the benefit of future generations.” In conclusion, Ricohermoso thanks the all the delegates, speakers, guests, and most especially the SIAP for the active participation and continued support. For more information about the Seaweed Industry Association of the Philippines, log on to siap-org.com. 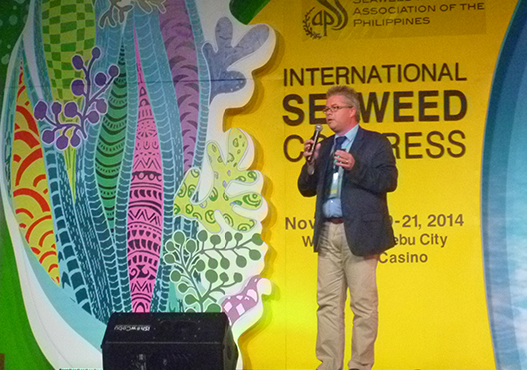 Photo shows Dr. Stefan Kraan from Ireland as he delivers a speech during the International Seaweed Congress held in Cebu City.